The newest version of our category-changing Speed Cart®, the V1 Sport combines new colors and graphics with the best features of the V1 Speed Cart along with an improved brake system, mag wheels and the E-Z Latch™ System, originally introduced on the SV1. • The patented fold-down design folds in seconds and fits easily into car trunks. • The E-Z Latch™ System simplifies folding and unfolding the cart and adjusting the handle height. • Cart folds down with bag attached for easy, compact storage. • Adjustable smart brackets secure the bag without the use of straps. • The ergonomic and adjustable handle positions arms and shoulders in their most natural position. • The umbrella mount secures an open umbrella. • Umbrella straps store a closed umbrella. • The accessories tray includes a bungee scorecard holder, drink holder and mesh headcover tray. • Sealed precision ball bearings ensure an easy roll and are maintenance free. If you have any questions regarding the 2015 Sun Mountain V1 Sport Golf Push Cart, please give us a call, we would be happy to help you with any questions you may have. 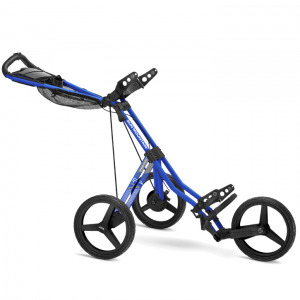 Write an online review on the 2015 Sun Mountain V1 Sport Golf Push Cart, and share your thoughts with others.